Been Thinking about Low Cost Foods & Winter Meals? By Amy Witt, Horticulturist, University of Maine Cooperative Extension, Cumberland County, amy.witt@maine.edu. Enjoy, preserve, and donate your harvest. UMaine Extension has a variety of videos and fact sheets on preserving so that you can enjoy the summer harvest well into the year. Once you have stored and preserved all you are able to, consider donating the extra produce to local food pantries through our Maine Harvest for Hunger program. Last year, farmers, and gardeners raised and donated 293,820 pounds (140 tons) worth $473,328 of vegetables and fruits to food pantries, shelters, and charitable organizations around Maine. Go to Maine Harvest for Hunger to find out how you can get involved. Visit one of Maine’s agricultural fairs. From Clinton to the Common Ground, there are still many fairs happening around the state in September. Go to the Maine Association of Agricultural Fairs to get the complete schedule. Review the year. How did your crops do; which vegetables were high producers; what plant varieties were your favorites; what were your successes and failures; what disease and insect pests did you have (for advice on any disease or insect pest, contact your local UMaine Extension county office); what is your plan for next season? Put your gardens to bed. In your vegetable garden, harvest remaining vegetables and fruits; remove spent plants and debris; plant a cover crop like hairy vetch, winter or annual rye to provide erosion and weed control. Mark your perennials before you cut them back, so you don’t mistakenly dig them up later in the fall or spring. Remember to leave plants with well-established seedheads, like cosmos, echinacea, and rudebeckia, as the goldfinches and other birds will enjoy them throughout the fall. Get additional tips from UMaine Extension’s video: Putting the Garden to Bed. Do a soil test and add appropriate amendments to your soil in preparation for planting next spring. Soil test kits can be obtained from your local UMaine Extension county office or directly from the Analytical Lab and Maine Soil Testing Service at the University of Maine in Orono. Watch UMaine Extension’s video on soil testing for more information. Dig up tender bulbs, corms, tubers, and roots (like canna lilies, dahlias, and gladiolas) after their foliage has died back or has been killed by frost. Cure them in a dry, well ventilated room with temperatures between 60º – 70°, and away from direct sun and wind. Most tender plants will take 1-3 days to cure (gladiolas can take up to 3 weeks). To store the cured materials, place them in a ventilated container and layer them with peat moss, sand, shredded newspaper or sawdust. Store them in an area with temperatures ranging from 40º – 50°. Divide summer blooming perennials. Dividing perennials helps rejuvenate and control the size of the plants, as well as increases the number of plants you have (which is great if you need more plants to fill in an empty space, establish a new garden bed, or share with others). Keep in mind that once they are divided, it will take 4-6 weeks for the transplants to become established. Be sure to give the plants enough time to settle in before the ground freezes. See the fact sheet Dividing Perennials published by Clemson University Cooperative Extension for detailed information and instructions. Plant spring bulbs. 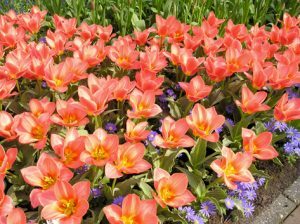 In addition to crocus, hyacinth, tulips, daffodils, and muscari, why not try something new this year like spring starflower (Ipheion uniflorum), orange candle flower (Arum italicum), or Dracula plant (Dracunculus vulgaris)? When selecting bulbs, make sure they are hardy and disease free. 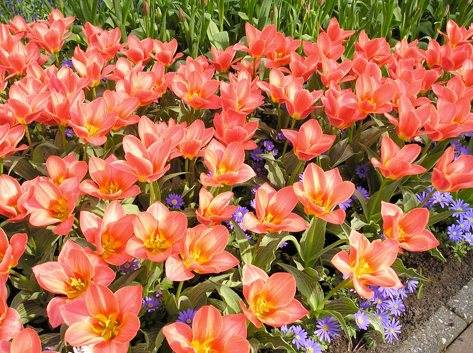 Bulbs should be planted in a well-drained soil with a temperature below 60°. Adding organic matter to the soil when planting will provide an added benefit to the bulbs. Plant trees, shrubs, and perennials. Fall is an excellent time to plant. Because plants are putting most of their energy into root development at this time of year they will be more established come spring. Also, many of the nurseries have sales, which means you can purchase more plants for the same money you would have spent on one plant earlier in the season. Refer to UMaine Extension Bulletin #2366, Selecting, Planting and Caring for Shrubs and Trees in the Maine Landscape for general guidelines on proper selection and planting. Prepare new gardens beds for next spring. It is easy—just determine the site, fertilize (for every 100 square feet of planting area, add 6 cups of a complete fertilizer containing approximately 5% nitrogen), and stamp down, cut or mow any existing vegetation so that all the plants lay flat on the ground. To prevent the roots from re-sprouting, add four layers of newspaper or one layer of landscape barrier paper on top of the area. Make sure to overlap the edges of the paper and wet the paper to keep it in place. Once the paper is down, cover it with mulch (to cover a 100 square foot area 1 inch deep, you need 1/3 cubic yard of mulch—you can use compost, grass clippings, seaweed, wood chips, leaves, straw, and so forth—try to use materials that are free of weed seeds). Let the area sit over the winter and it will be ready to plant in the spring. Fertilize, establish or re-seed your lawn. The period between mid-August and mid-September is the best time to pamper your lawn. For more information about establishing a lawn, see UMaine Extension Bulletin #2367, Establishing a Home Lawn in Maine. 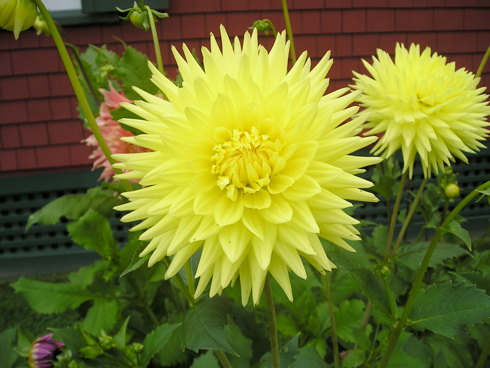 By Katherine Garland, Horticulturist, UMaine Extension, Penobscot County, katherine.garland@maine.edu. The sun is shining, a Master Gardener has pulled the hose across the parking lot to the garden, bags for harvesting are lined up by the fence, and kids are beginning to arrive. Welcome to Kids Can Grow at the new Youth Community Garden in Bangor, one of several Master Gardener projects in Penobscot County. Kids Can Grow is a 4-H youth gardening program that provides young people with the training, tools, seeds, and supplies necessary for success in their own garden. Kids Can Grow sites are dotted throughout the state, each with their own unique character. The Bangor program began meeting after school in late April of 2012. Participants were matched with a Master Gardener Mentor who helped them work on planning their own 3’ x 5’ garden plot found within the collection 20 raised beds located at the Bangor Housing Authority Community Center. During after school meetings in the spring, we enjoyed healthy snacks, started seeds, constructed raised beds, and planned a few extra gardens for kids who would enter the program later in the season. 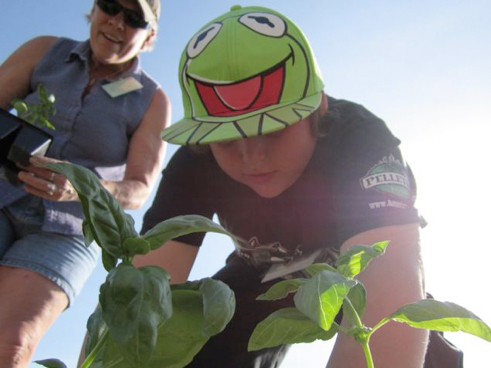 Weekly summer activities included garden planting, nutrition lessons, garden maintenance, entomology, and composting. Our young farmers enjoyed a bountiful harvest this year and none of it would have happened without the generous support of our dedicated Penobscot County Master Gardeners who made this program a great success: Ellen Fisher, Jim Green, Alix Johns, Mara Kosa, Jan Placella, Dale Quimby, and Susan Sombret. For more information on the Master Gardener Volunteer Training visit umaine.edu/gardening/master-gardeners. 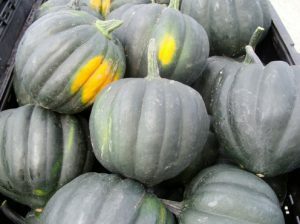 How do you know when pumpkins or winter squash are ready for harvest? The best thing to do to determine ripeness is to look at the “ground spot.” The spot where the fruit sets on the ground will develop a deep yellow or deep orange color. This color change is a good indication that the fruit if ready to pick. When I harvest winter squash or pumpkins, what do I need to look for in regards to quality, size, and being blemish-free? The skin of the pumpkins or squash should be sound (no obvious wounds, lesions or soft spots). The stem should be firm and well attached to the fruit. Minor scrapes or cuts can sometimes be resolved with good curing. I have heard that winter squash stores better when the squash is cured. What does curing entail? Curing is basically a process for the skin to thicken to preserve the flesh better. Curing involves storing the harvested fruit it in a warm, dry place for about 2-3 weeks, such as in a greenhouse, a high tunnel or upstairs in a barn. Field curing of harvested fruit gathered in a windrow and left in the field is also used. If the windrow method is used, the fruit must be protected from frosts and freezes. By the end of 2-3 weeks, the pumpkins and squash are then placed into cold storage 50-60 degrees F. An unheated bedroom or cellar works fine. What effect does frost or freeze have on winter squash or pumpkins in the field or left outside (uncovered)?Low temperatures tend to freeze the skin of the fruit. After freezing, the skin becomes soft. With softened skin, the fruit will lose its storage life. If pumpkins or squash have been frozen, they should be consumed or processed immediately. Which winter squash varieties store best for long-term storage? Buttercup, Hubbard, and Acorn can store for long periods if cured properly. Are there some varieties of pumpkin that are better for eating than others? Yes, UMaine has been looking at varieties for several years. In general, some varieties are sold as “pie type” or “eating type.” These are small (3-5 lb.) fruit, including varieties such as New England Pie, Small Sugar, and Winter Luxury. They have much better eating quality than the larger jack-o-lantern pumpkins. FYI, good pumpkin pies are usually made with squash. What do I look for when selecting pumpkins and squash varieties for next year?Look at the descriptions and characteristics in the seed catalogs for next year’s selections. Seek varieties that mature under 100 days (if direct seeding). Plant seeds or transplants after the danger of frost has passed. What is the difference between winter squash and summer squash? All squashes are in the genus cucurbita. Within the genus are three main species. They include: cucurbita pepo (star shaped stem); cucurbita maxima (Banana, Buttercup, and Hubbard); cucurbita mochata (Butternut, Wheel pumpkins). All summer squash varieties are in the genus and species cucurbita pepo; the skin and flesh of summer squash are meant to be eaten when the fruit is immature. Summer squash are divided into three general types: yellow, green or scallop. Winter squash have thick skin that is meant to be peeled, leaving the flesh for consumption. I have limited garden space and I am unable to produce large quantities of vegetables or fruits to preserve or store for the winter. What I commonly do to rectify the situation is to search out and purchase produce from local farmers that is low cost and easily stored (unrefrigerated). I focus on four vegetables — potatoes, rutabagas, carrots, and winter squash. When you consider the price of food, these four vegetables are a real bargain. The price of these vegetables is typically at or under $1.00 per pound. These types of vegetables can be stored in a cool, clean place that is protected from freezing temperatures. Are you in the same situation? If so, you might try these activities. Take a fact-finding tour of the produce section of your local grocery store or supermarket. Go there with the purpose of finding foods that are $1.00 per pound or under. Bring a hand calculator and small pad of paper (or your cell phone for picture-taking). Check the unit pricing label so you can easily compare price per pound. This is what you will probably find: a 10 pound bag of potatoes in the grocery store is typically about $5.00 (50 cents/pound); rutabagas are 89 cents/pound; a 5 pound bag of carrots is under $5.00; and the price of winter squash ranges from 80 cents to $1.00/pound. Much of the produce in the grocery store likely came from farms within Maine (or could have). You can probably find lower prices and larger units from local farmers. Interview family members to determine what low cost produce is favored for winter consumption. Think like your grandparents or think like a pilgrim. What did they stock up on in the fall for the long New England winter? Depending on your location (and the price of gasoline), schedule a road trip to Aroostook County in early October. Columbus Day weekend is a great time for a road trip to The County. You will find potato growers selling 50 pound bags of their potatoes on the roadside at prices that range $10.00 to $18.00 — that’s 20 to 36 cents a pound! Do you know a farmer who grows potatoes, carrots, winter squash or rutabagas? If so, make a connection now to arrange to purchase 10-20 pounds of produce. Many of these crops are harvested in September. If you don’t know a local farmer, you can find Maine farms at the website of the Maine Department of Agriculture: Get Real, Get Maine and Find a Farm. 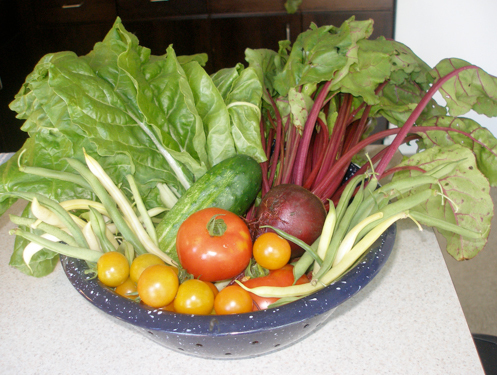 Seek out a winter farmers market in your area or participate in a winter CSA. This type of produce is typically grown and sold at these markets. This strategy might be appropriate for you especially if you lack storage space. Before purchasing bulk produce for winter consumption, calculate how much your family will consume over the next 6 months (November to April) and make sure you have a suitable space and site for proper storage. An unheated bedroom or an unheated cellar works well for most produce. Food grade plastic bins are cheap containers for keeping produce organized, clean and protected. Condensation can occur, so check the bins occasionally (once or twice a week) and wipe any moisture collecting on the sides or lids. Line the bins with newsprint to absorb condensation. Produce stores best under conditions of proper temperatures and humidity. Be aware of rodents and watch for signs of their presence. Address rodent control quickly. Rodents are seeking winter harbor, too, and usually start entering homes and cellars in October. There are some other low cost foods that are produced locally that you could buy in bulk. You might consider beets, cabbage, apples, onions or garlic.